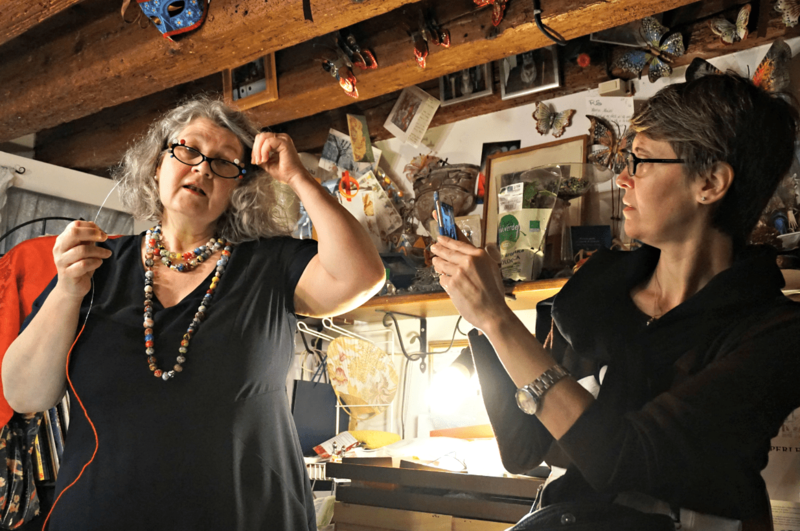 Recently I had the pleasure to attend a workshop in Venice with Marisa Convento, aka the Impiraressa. Impirar is a Venetian verb meaning thread/insert and it refers to her job. In fact she threads glass beads in order to create different kinds of bijoux and ornaments. She is one of the few left in Venice. Marisa Convento’s shop, Venetian Dreams, at a stone’s throw from San Marco, is tiny but cozy. Full of beads, necklaces, photos and knick-knacks. There was also a dog, so shy that we ad to ignore him, not to upset him. Poor thing! When I entered, the personality of Marisa won me over immediately. Firm but kind. You have to know that I had a very anxious mother. She never let me do anything. Don’t touch this! Don’t touch that! You can’t do it! were common sentences at home. Therefore, even after many years, whenever I have to face new experiences I’m always worried. So, I loved the fact that Marisa insisted that we all try first hand to experience the different phases of an impiraressa work. To my surprise and relief, in the end I wasn’t the only worried one there. Also the other girls were a little clumsy. We had fun and we all managed to complete the tasks. We threaded some tiny beads, called conterie, helping ourselves with the sessola, a bent wooden box where you keep the small beads; we then created a small part of the famous Marisa’s corals, and finally some beads petals. In the meantime we heard many stories about the impiraresse. The thing that hit me the most was to acknowledge that Marisa is basically self taught. In her life she worked for several artisan shops in Venice, that had nothing to do with the beads world. She then fell in love with the venetian beads and learned some of the techniques she now masters “only” by reading, going to markets, buying ancient impiraresse works and trying to reconstruct the way they used to do them. There were no written testimonies. The first beads produced in Venice were those for the prayer rosaries. 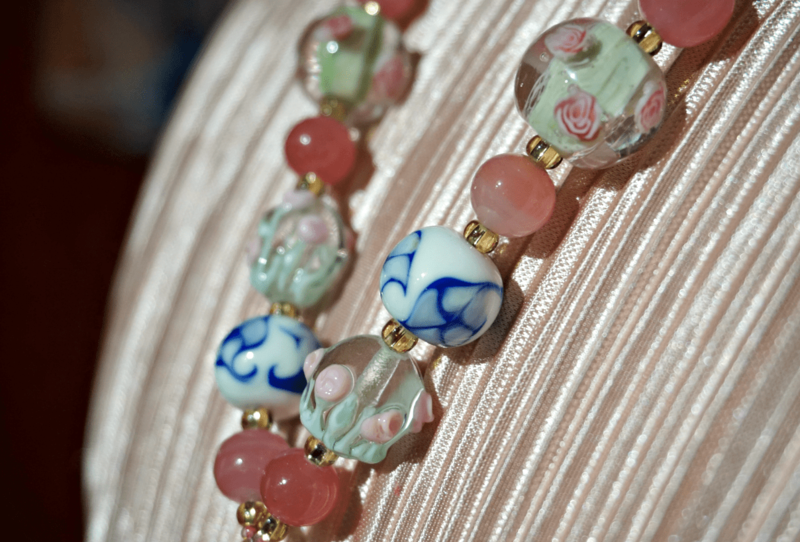 But at the end of 1400 the first decorative glass beads were created. They were so beautiful that everybody wanted them. Therefore Venetians exported them in all continents. They were so precious to be used as money. Impiraressa was one of the less paid works in Venice though, only performed by poor women. They had to do this job in order to help their families. And, at that time, the work was not creative as that of Marisa. It was repetitive. Their only task was to thread the beads to create some bundles, called matasse. One matassa was worth a half kilo of goods. Just to give you an idea of the value, you could buy a slave with 4 bundles. But sadly the impiraresse were paid almost nothing. Working 8 hours per day, they earned the money to buy 1kg of bread. At the beginning of 1900, the impiraresse were more than 5.000. Until the 1960s, you could spot some impiraresse working along some calli, mainly in the Cannaregio or Castello sestieri. But then, with the evolution of the woman’s role in the society, and the progressive depopulation of Venice, impiraresse went almost lost. The shop of Marisa is full of memories and beautiful pieces. I set my eyes on works made with the beads by Alessia Fuga. Some delicate and transparent, decorated with flowers. Others sensuous and alluring, like the beautiful pendants. Also beautiful were the bijoux obtained with the beads made by Sara Bucella, like the tutti frutti necklaces. An example is the very necklace worn by Marisa. The name tutti frutti refers to the multiplicity of colors, shapes and decorations of these beads. You also may have seen Marisa’s corals sewn on the typical furlane slippers. Or wedding bouquets made of beads flowers. For Marisa, this job is a passion and a vocation, some sort of mission for herself and for Venice, in order to preserve the quality crafts shops.